Submitted by CAphyl on January 27, 2015 – 2:07pm. 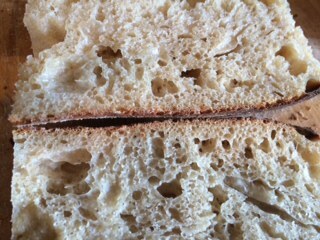 It is one of those days that started with bread and will probably end with bread. I’ve got dough in different stages and plenty caked on my hands. I have been experimenting, too, and it’s been a bit mad. 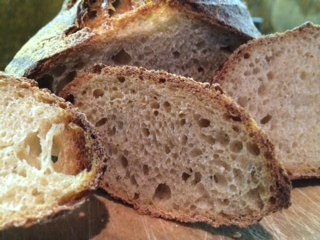 I have been pushing the limits of cold fermentations and began making one bread and then made another with the same dough! 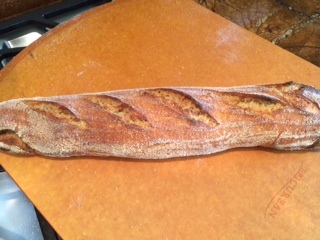 Today, I baked a baguette that started as a classic sourdough. 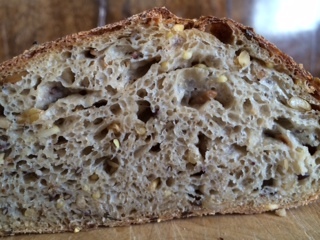 I had been bulk fermenting some dough for a really long time as a test (about five days) and decided to divide it in half and bake part of it. 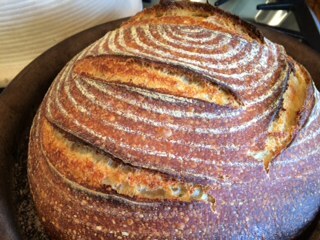 I had waited so long as I had three loaves of the eight grain in line ahead of the classic sourdough. 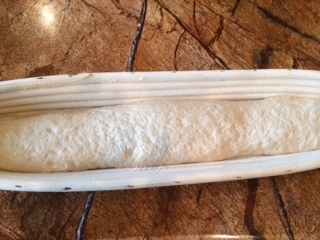 I made a batard from the half of the classic dough for my husband the other day with the first half of the dough (see below). 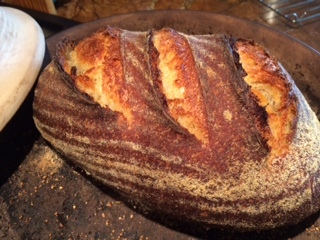 I am not sure why, but I tend to make boules with the classic sourdough and this time I made a batard. I was glad I did. 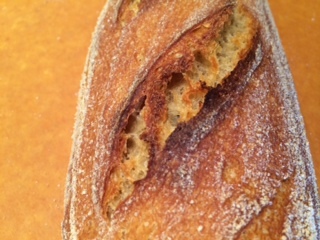 Well, I was really pleased with the experiment on the baguettes and may try it again. Call me crazy! 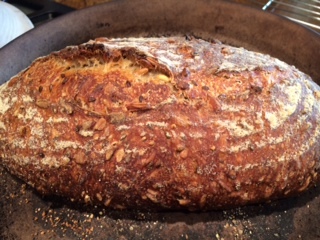 In the last week, I also made some more five grain (it’s really eight grain now as I added so many seeds to the soaker) and my usual classic sourdough, which I gave to a number of friends. I have to share one of my favorite new recipes, which is for heirloom carrots. It is so simple and good. We got the heirloom carrots at the farmer’s market, and they are just so beautiful. I used our own fresh thyme, but you can also use rosemary. The recipe is at bottom. Today, I am working on three different breads, and we will have to see how they turn out. One other thing I wanted to mention. Do you notice that all your devices are clogged with bread photos? That is the case with me. I really have to remember to keep cleaning them out, as there are inevitably so many more to come! 1Preheat oven to 425F. Line a large baking sheet with aluminum foil. 2Slice the carrots in half lengthwise. In a large mixing bowl, toss with oil, salt and pepper until evenly coated. 3Arrange carrots in a single layer on the prepared baking sheet, and scatter thyme sprigs overtop. Roast in preheated oven for 15 minutes. 4In small bowl, whisk together honey and balsamic vinegar. Pour over the carrots, and gently roll them around to coat. Roast for a further 15-20 minutes or until carrots are tender and caramelised. Serve immediately.